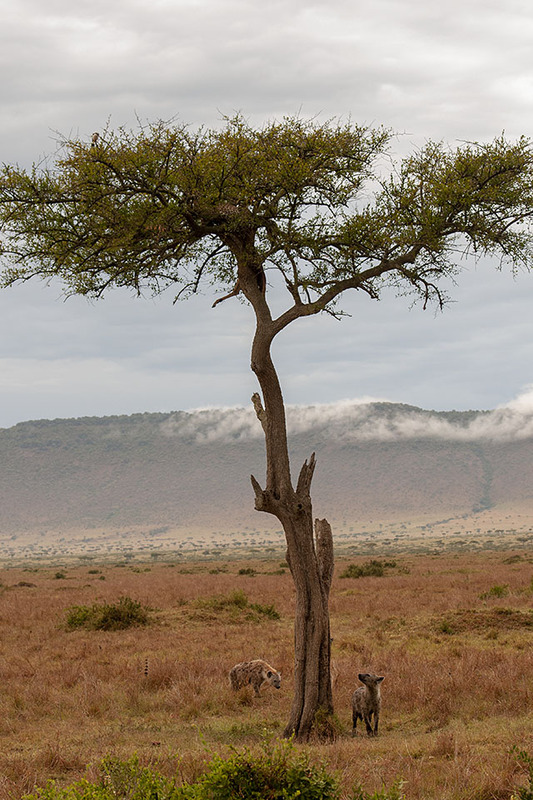 It was a rainy afternoon in the Maasai Mara National Park and we we set out on our safari. We were headed towards one corner of the park where a couple of African Lions had been spotted in the morning. While we were photographing the Lions, we got a call saying a Leopard had been spotted walking along the road in the downpour. 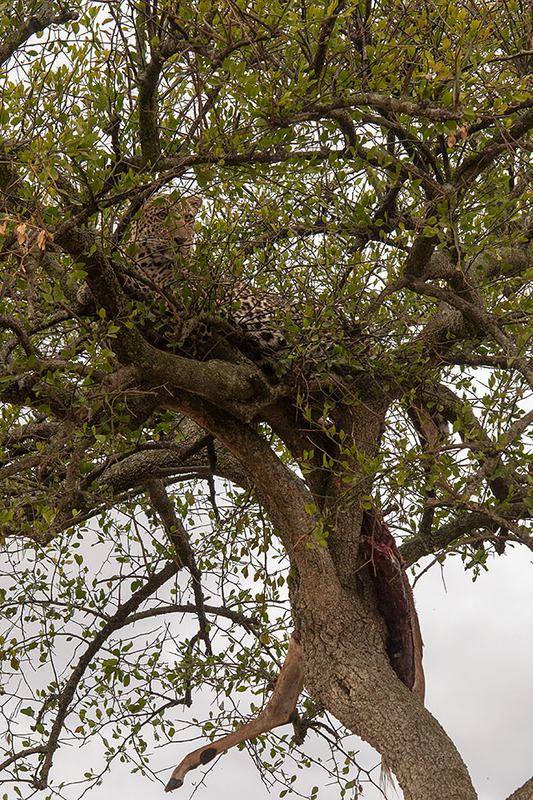 Within a matter of minutes, we heard of another Leopard sighting, and this one was on a tree. 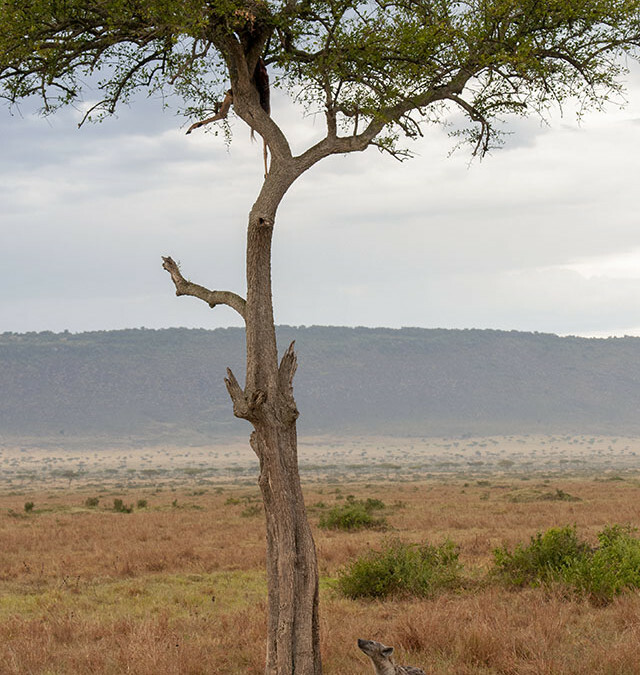 We had to abandon photographing the Lions and rushed to the area where the second Leopard was spotted. When we reached, we noticed that we were the only vehicle around, and were welcomed with this picture. 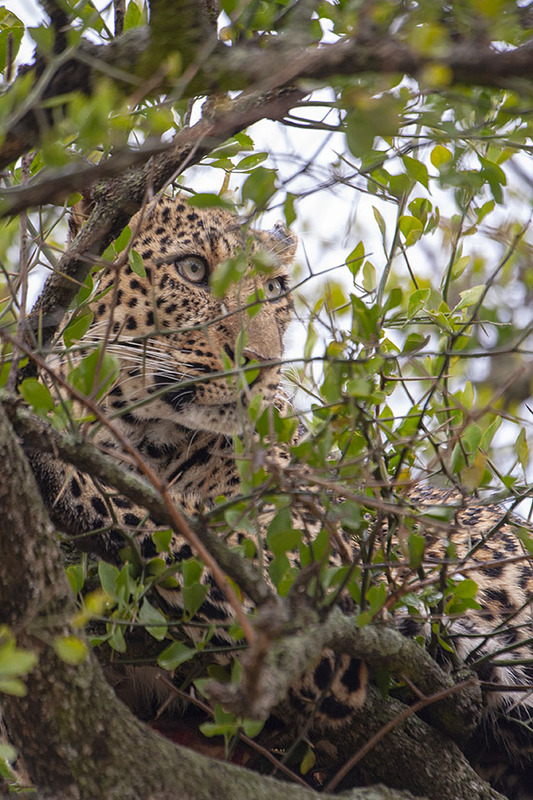 We were captivated by the sight of this Leopard with the Impala kill and we took our time to soak in the experience. 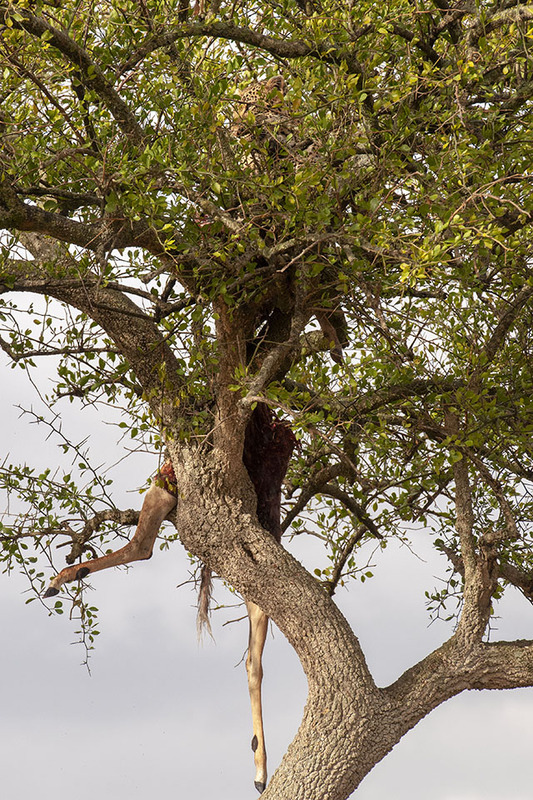 When we circled for a different view, we noticed the huge size of the Impala. 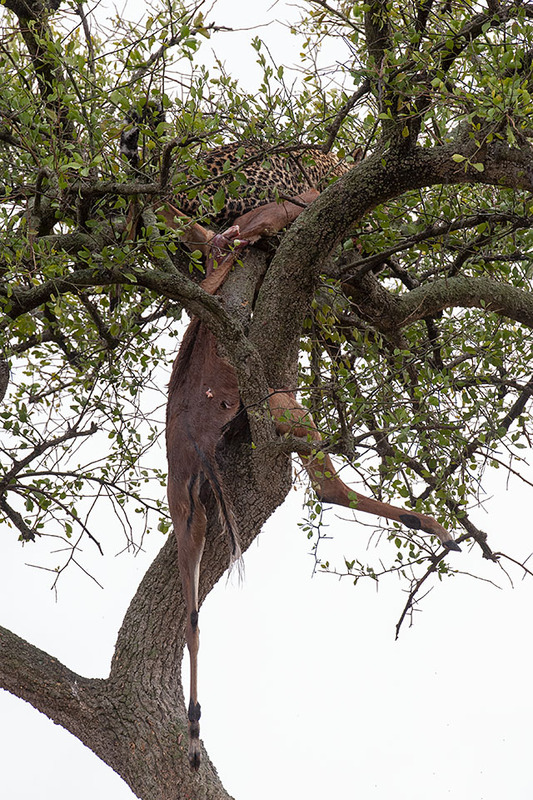 The immense strength of this Leopard to have hauled this huge Impala up this tall tree was truly incredible. 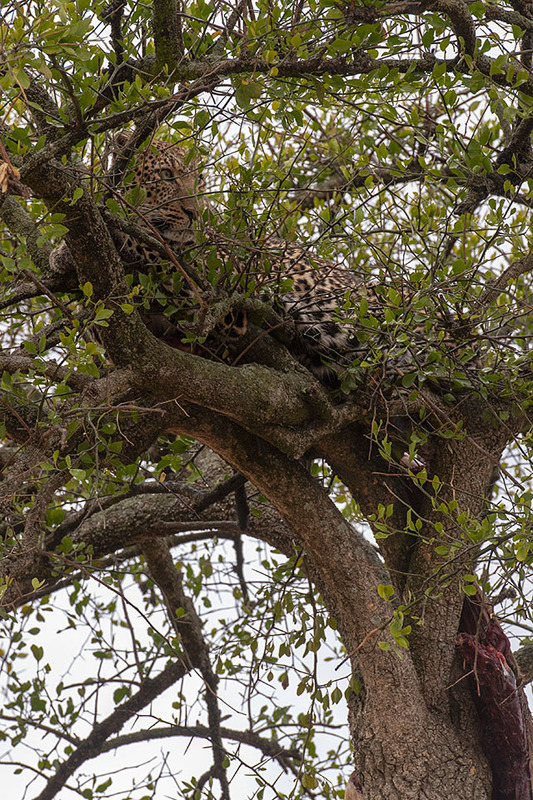 We then zoomed in on the Leopard to see how perfectly it was camouflaged on the tree top. Here’s another picture from a slightly different perspective. It was only now that we noticed that the Leopard was every now and then looking at something in the distance. We once again zoomed in and it was clear that something in the distance was bothering the Leopard. And after a few minutes came the Spotted Hyena, that had caught the scent of the kill, which we featured in the first picture of this post. The Hyena sniffed around to see if the Leopard would drop a piece of its kill; but alas, it wasn’t the case. The helpless and disappointed Hyena went away and then to our astonishment returned with a friend to torment the Leopard into parting with its kill. Given the height at which the Leopard had stashed its kill, this was clearly going to be a battle of patience and endurance. It was getting dark and we had to return to the lodge. We left the Leopard and Hyenas to sort their differences and headed back.